Secrets of Swimming Faster Part 6 of 9: Do Less. Get More. Bernard’s peak velocity during that 100 was higher than Lezak’s, but he paid far too high a price, allowing Lezak to storm past as Barnard fell apart. Here’s the surprising part: While it looked as if Lezak was gaining speed near the end, it’s highly likely he was slowing slightly. Virtually all 100m freestylers are losing speed during the final 25. Whoever does the best job of controlling deceleration wins the gold. If Bernard, the 100m world-record holder, could fail so miserably at swimming sustainably, think about how critical it is for a triathlete — even one competing for personal satisfaction rather than Olympic gold — to make Sustainable Swimming (Doing Less) your highest priority. Bernard only has to swim for 46 seconds. You need to sustain for anywhere from 30 minutes to 2-plus hours. Bernard only has to swim 30+ to 40+ strokes before his arms get a rest break (on turn and pushoff). You need to swim 2000 to 4500 uninterrupted strokes. Bernard’s day is done after 46 seconds of swimming. You need to bike and run for 2 to 15+ hours after swimming. I compete in the pool, as well as in open water. In training for both, my first instinct is always to Do Less Before Doing More. The challenge in pursuing actions such as these is that human instinct and conventional wisdom (i.e. what nearly everyone says you should do) is to Do More (more yards, faster strokes, harder pulls.) But after 45 years of training and 400 to 500 races I’ve learned that my best practice swims and sets, and my most successful races have come when I tirelessly sought the easiest way to swim fast. When working on my armstroke, I think first and foremost about using my arms to: (i) lengthen my body (ii) separate water molecules; and (iii) cause as little noise, splash or bubbles as possible. I think last and least about pulling faster and harder. When working on my kick, I think first and foremost about: (i) getting my legs to draft behind my body; (ii) about using a light, compact toe-flick, not a powerful leg drive and (iii) using non-fatiguing core muscle, not fatigue-prone thigh muscle. I never think about kicking harder and faster. When working on my catch, I focus on: (i) starting it as slowly and patiently as possible – indeed to have my hand be still for a nanosecond before stroking; (ii) on feeling the lightest possible pressure on my hand and forearm, at any given speed; and (iii) on holding my place, rather than pushing back. In 2006 I broke the US Masters record for the 2-Mile Cable swim, in a time of 47 minutes – a pace of 1:28+ per 100m. In 2007, I swam the same event in 46:20 – a pace of 1:26+ per 100m. My training focus between the two swims was far more often on finding the easiest way to swim a 1:28 pace – so a faster pace would become inevitable – and far less often on pushing myself to swim faster. Last week I had one of the best meets of my life – including (at age 60) a lifetime best 200 Butterfly – at the Colonies Zone Masters. 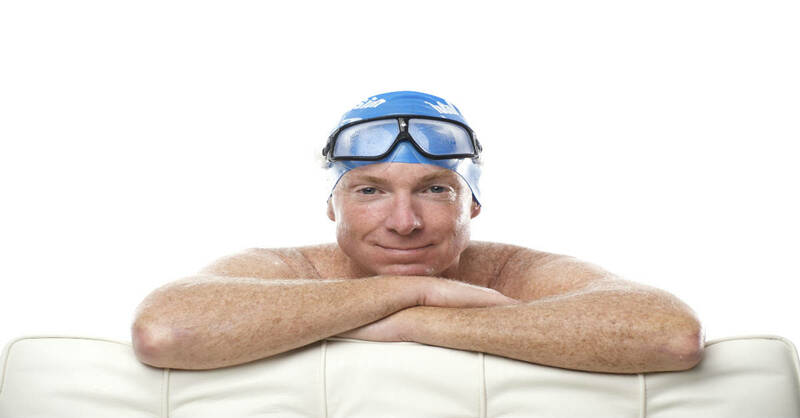 Next week I intend and expect to swim even better, and make substantial improvements in all events, at Masters Nationals – by swimming the first 50 to 100 yards of each event in a consciously more relaxed manner, so – like Lezak — I can swim far more strongly in the middle and latter stages. Read a description here of how I apply that strategy in practice. Why does Doing Less work better? I believe it mainly has to do with the fact that Swimming Happens in Water. 1) Water is an alien environment. When your instincts are all wrong, putting more effort into them can only increase errors and ineffectiveness. 2) Water is, well, water. When you push on it harder the two most likely things that can happen — neither of them good — are: (i) it just moves around, and (ii) it pushes back harder. What Sustainable Strategies will work for you? I am 1.67 m (5’7″) , short , short arms. I am working patiently with this concept while so many seem to emphasize how much mileage I need to do before the Chesapeake Bay swim. It will be the longest swim I’ve ever done and I can’t seem to stop having some concerns about it. It’s not speed. It’s just doing something new and hoping my body can healthfully sustain for that long. Thank heaven I have the TI teacher training a few weeks before. That should help. This is more than twice the distance I’ve ever done and I have this “yes, but, yes, but,” chatter going on. So I’ll go to the pool in awhile and be patient and be aware and enjoy and make sure that’s what I’m practicing moving forward. Thanks for re-enforcing what I know while I work to turn it into belief.